GiftsForEurope is a recognized leader in international gift delivery of quality corporate gifts to all of Europe. With over 10 years serving corporate customers in their European gifting needs, we are a highly competent and skilled company prepared to make your corporate gifting experience a pleasant and successful one. Our extensive catalog of international gifts designed with the best European brands makes international gift delivery easy. With corporate gifts in every budget, we are sure to have a solution for your important clients overseas, employees and more. Whether you want to say thank you, welcome to our team, or introduce yourself, we have a gift to meet your corporate need. And if you desire, our staff can tailor a gift to your specific need. Provide an account center where you can conveniently track your gifts, access invoices and much more. Download our electronic order form and e-mail your order back to sales@giftsforeurope.com. Gifts can also be sent to different countries in one order. Click on the top logo to change the country of destination. 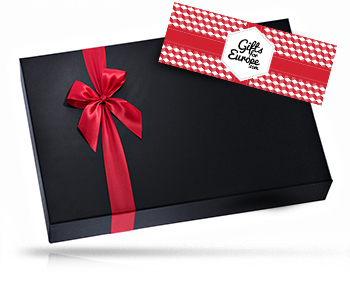 The personalization of your gift card with specific themes or your own photos, logo or image is free at GiftsForEurope. Brand your gift with personalized ribbon or packaging. Please allow up to 4 weeks for creation of ribbon. We are specialized in gifts and hampers for different occasions, and the Christmas holidays season is one of the occasions for which we can create a broad range of gifts. Whether you would like to send Christmas gift baskets to countries such as the UK, Germany, France and Austria, or if you are looking to deliver personalized wine gifts to your business partners located overseas, the team of gift experts at GiftsForEurope is ready to assist you in selecting the perfect gifts for your recipients and delivering them on the right time.